Chindits: CO 42 RR Succumbs.. From 2/9 Gorkhas.....Was Conferred YSM Yesterday....R.I.P....Lived Upto His Whatsapp Status !! CO 42 RR Succumbs.. From 2/9 Gorkhas.....Was Conferred YSM Yesterday....R.I.P....Lived Upto His Whatsapp Status !! 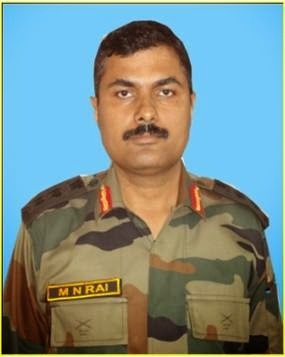 Col M N Rai succumbed today to terrorists' fire in Tral, J&K. From 1 Sector RR.. Received input about two terrorists and launched ops. Is from 2/9 Gorkhas. Wife is in Delhi, but from Lucknow. His whatsapp status is " Zindagi mein badi shiddat se nibhaao apna kirdaar, ki parda girne ke baad bhi taaliyan bajti rahen"
Two militants including the District Commander of Hizbul Mujadheen were killed in a brief gun fight at Handora hamlet of Tral town in South Kahsmir's Pulwama district on Tuesday. The HM District Commander accompanied by his associate had arrived at his home when Army and SOG personnel cordoned off the house and neutralized both the militants after two minutes gun fight. An Army Colonel identified as M.N.Rai, Head Constable Sanjeev Singh and two more soldiers of Rashtriya Rifles were injured during the encounter while officials said that the Colonel was airlifted to Badamibagh based 92 Base Hospital in critical condition where he along with the Constable Singh succumbed to his injuries. Police sources told that, HM District Commander Abid Ahmed Khan son of Jalaluddin had arrived at his Handora village to meet his family members. He was accompanied by his associate Shiraz Ahmed Dar son of Ghulam Hasan Dar resident of Warigund Tral. ?We received inputs about their presence and without any delay joint Army parties from 42,180, 185 Rashtriya Rifles along with SOG Tral cordoned off the village. As the army zeroed in and came close to the house, the militants fired upon Government Forces resulting in the injury of four Government Forces personnel,? a police official said. Sources said that as the Colonel Roy of 42 RR tried to enter into the house during the gunfight, the militants targeted him and injured him critically. ?The injured Colonel and Head Constable were airlifted to 92 base Army hospital in Srinagar, where they breathed their last ,? police official said adding that both the militants were neutralized after 20 minutes gun fight. its quite tragic....please do not send senior officers...even though every life is valuable.The info could have been planted by terrorist relatives,as a trap....How many soldiers have to did like this.....quite sad....pakis are winning the proxy war this way!!! !